This is becoming quite the fractured season of Z Nation. First, Murphy and 10k split off from the rest of the group. Then, 10k got lost in the woods. After that, it was the Doc and 10k show. And now, just when the gang had (mostly) reunited, Warren decides they’ve got to separate once more. Story-wise, all this shuffling around makes sense, as there are a couple of big plots unfolding that need to be addressed, and sending the whole gang across the country and back would’ve delayed the necessary showdown with Murphytown. Instead, Addy has finally been let out of whatever penalty box the show was keeping her in, and with Doc in tow, they’re off to find baby Lucy. It’s time for some missions to start really pushing things forward. Except, this week doesn’t do that at all. 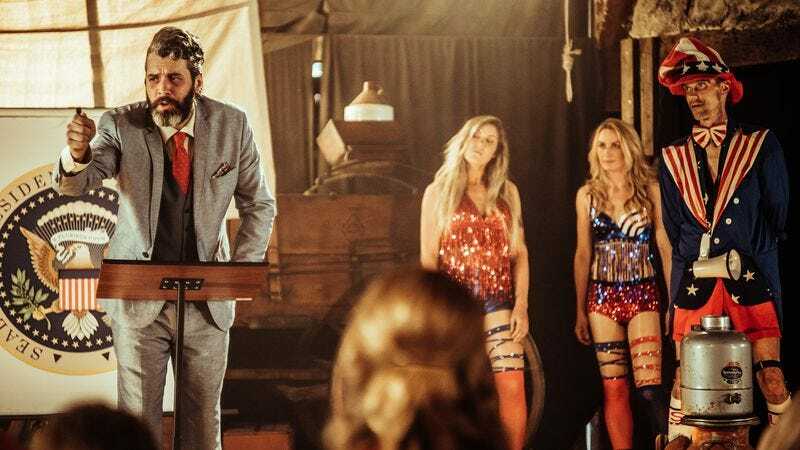 It’s another totally extraneous side adventure, but luckily, the detour is one worth taking, as it leans hard into the absurdist comedy of the series, going full bonkers with the story of President Thurston Howell IV, a.k.a. Sketchy McClain. The con man and his dim-bulb cohort Skeezy reappear this week, traveling in a presidential motorcar (straight from the Clinton museum) and flanked by two motorcyclists who turn out to be “pom-pom girls,” Gina and Tina. And while it was fun seeing the show successfully reenter the land of loony antics (this episode did right all the things that felt so forced and lazy in “Doc Flew Over The Cuckoo’s Nest”), having Addy speak truth to idiocy—in the midst of Z Nation giving its own gleeful version of a presidential election—made the whole ludicrous enterprise satisfying as well as funny. “Election Day” wasn’t so much the show satirically commenting on the current presidential election (they really snuck this one in at the last second of the campaign) as it was taking a blowtorch to the entire concept of lampooning something already so insane. As a result, just when it seemed clear Sketchy and his plan to build a giant wall was a blackly comic sendup of Donald Trump, along comes John J. Lannister, who does one better by even somewhat resembling the flaxen-haired jagoff in both mannerisms and dress. This is when any wheels remaining on the political points being made went flying off, and it became a free-association game of tossing out any and all references, regardless of logic or consistency. The Trump-against-Trump farce eventually devolves into the two morons literally jumping over Addy in slow motion to get away from the zombie she’s smashing into pulp, only to both immediately claim credit for the kill. Still, even with the ridiculousness cranked up well past 11—topping out somewhere in the 47 range, let’s say—the show did make a few genuinely critical observations, albeit it in a fairly simple manner. The biggest idea conveyed this episode was about the need for direction, especially in times of crisis. The people of Wall Drug (an allegorically appropriate location for these events if ever there was one) are tired of feeling adrift and screwed, so when someone comes along and tells them there’s an answer (even someone as silly as Sketchy, and an answer as stupid as forcing Zs to build a massive multi-state wall to keep them safe), they’re desperate to believe it. ”At least he’s doing something. Somebody’s finally giving us hope,” Erin tells Doc and Addy, capturing the essence of the bizarre suspension of reason taking place. It’s the show offering its own explanation for the rise of Trump, and doing so with more empathy and understanding than a lot of supposedly more intelligent analyses. Doc is turning out to be the biggest hero of all this season, having now led multiple side missions in which he played a pivotal role helping others, be it the jailbreak of the insane asylum or solving the mystery of the yellow eyes at Wall Drug, which he does by tracing the infection to the water supply. (Pulling a waterlogged zombie head out of a clog in the pump system is a pretty gross way to confirm there’s a problem.) It’s debatable whether the fault for the subsequent water contamination argument between the “candidates” and the people is the fault of the wannabe politicians, the people so ready to close their eyes to reality, or both. That’s a chicken-or-egg question, but the path out of such a spiral of ignorance is clear: Send in a horde of hungry zombies, and people will pull their heads out of their asses—for awhile, anyway. 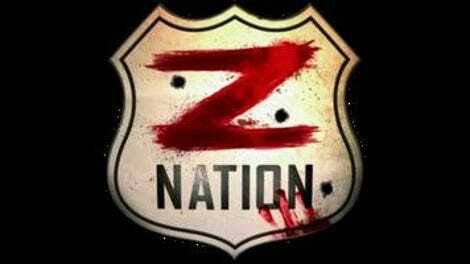 It’s refreshing to see Z Nation finally deliver a truly bananas installment this year with flair and appeal. The show’s strengths have turned toward more consistent serialized storytelling as the breadth and scope of the world (and inner worlds of our characters) deepen, but every once in a while it’s satisfying to get an old-school episode of inspired nuttiness that has nothing to do with anything, even if the presence of the rest of the team is missed. Addy got more of a starring role here, which helps make up for the astonishingly small contributions she’s made thus far in the season. Now that she’s part of team Lucy, it can hopefully get the character back to the front lines of the story, and as the others converge on Murphy, the odd couple of Doc and Addy should make for a great comic foil, even without the world’s worst presidential contenders in the same room with them. Lannister’s slap fight with Sketchy and Skeezy was good, as was Skeezy swiping the wig off his head, only to learn it smells like cheese. Gina and Tina’s reveal was the kind of train-going-off-rails lunacy that makes Z Nation what it is. Can anyone suss out a pattern as to why certain episodes have the silent opening logo sequence (like this one), while others still include the traditional theme? Oh, and let’s not forget that Tina (or is it Gina) strikes a pose after they take out one of the party crashers.